The summer of 2015 has been one of the coolest on record up to this point, but now the high temperatures are bearing down on most of the country. Keep a close eye on your cooling system to make sure you get to your destination without fail. There’s a side benefit in fuel mileage, too: Allowing your engine to run just 10-degrees hotter than normal could mean the difference between good fuel mileage and poor fuel mileage and that is not mentioning the inherent damage done over a few months. Here are a few tips to help you maintain your cool during even the dog days of summer. 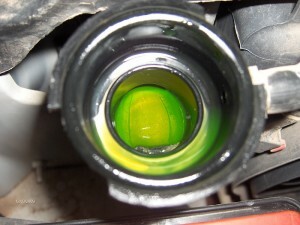 A clean mixture of fifty-percent antifreeze and fifty-percent water is a good way to promote efficient engine cooling. Deposits from dirty coolant or rusty water act as a coagulant in your cooling system, stopping up coolant passages and increasing engine temperatures. I am hesitant to say that extended life engine coolants are an incredible load of hogwash — but I did anyway. Extended life coolant formulas like Dex-Cool have been responsible for more failed cooling system and engine components in late model cars than anything else. 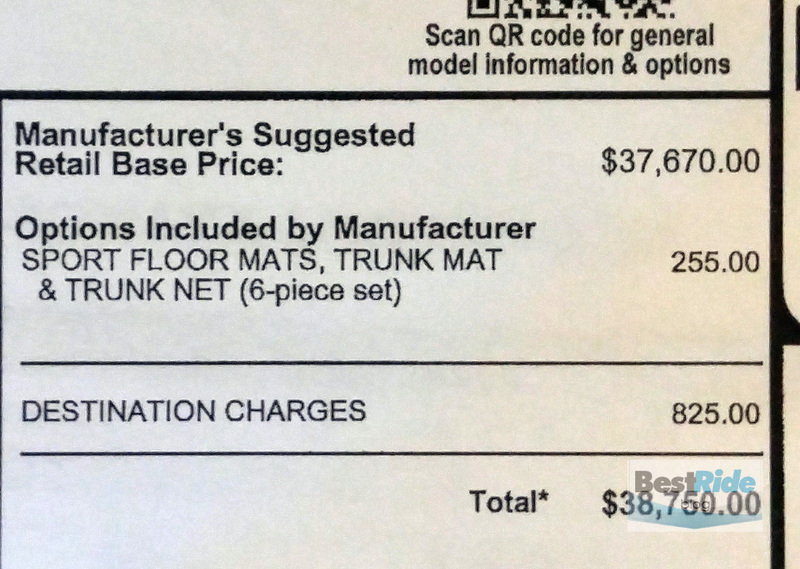 They are so hazardous and have negatively affected vehicle cooling systems so negatively that massive class action lawsuits were brought against GM (and settled). 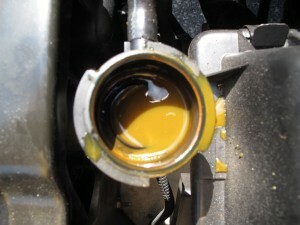 Listen carefully; change your engine coolant annually. I don’t believe for a minute that any type of coolant can remain effective for 150k miles. That kind of thinking is ludicrous and irrational. You will need a garden hose with average water pressure, a method of catching the old antifreeze for proper disposal, and 2-gallons of replacement antifreeze. You can refill the radiator using one of two methods. You may purchase a pre-mixed blend of antifreeze and water or you can pre-mix in the radiator. The simplest method of flushing the old dirty coolant from your engine is this: With the engine cool, remove the end of the lower radiator hose from the water pump. As the old coolant runs out, crank the engine and allow the thermostat to open fully. Once the thermostat is opened refill the radiator with the garden hose, using the open end of the lower radiator hose. Keep an eye on the coolant that is being pumped from the engine. When it begins to come forth as a clear liquid turn the engine off and allow the remaining water to drain from the engine and radiator. Now, reconnect the lower radiator hose to the water pump and refill the system with a 50/50 mixture of ethylene glycol coolant and water. Repeat every spring. The importance of clean, cool air to your engine is often overlooked until a major overheating issue is thrust upon you. Electric and belt-driven fans move much needed air across the radiator, a/c condenser, engine block, and cylinder heads. 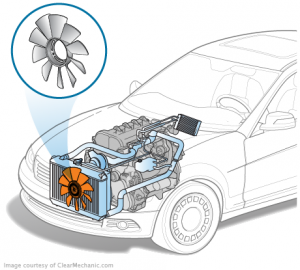 This clean air is drawn from outside of the engine compartment by the motion of the fan/s. Air is typically drawn across the radiator in order to cool the coolant inside and then used to air-cool the engine block and heads. If obstructions are present in the radiator area there is just not enough air for this method to work efficiently. You can begin by laying a small flat piece of paper against the front of the a/c condenser (with the engine cooling fan running) and see if the fan is drawing sufficient air into the engine compartment. If ample air is being drawn in, the piece of paper should remain in place when you put it against the condenser and remove your hand. If the paper falls to the ground, then you have either some type of obstruction or the fan is not operating properly. Look at the front of the a/c condenser. Is it sodden with bugs, road grime, or other debris? Clogged cooling fins in the condenser or radiator will prevent clean air from reaching the engine compartment and create higher temperatures. 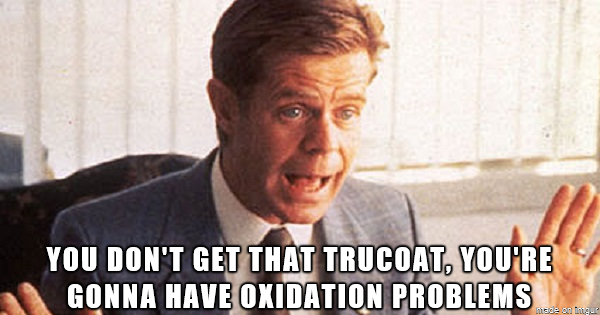 If this is not the case, then look between the a/c condenser and the radiator. Be careful not to burn yourself. If there is a cover or fan shroud covering the gap between the radiator and condenser, just remove it carefully and gently lean the radiator away from the condenser. This is an area that is well known for trapping leaves, straw, and other debris that can restrict clean air from reaching its proper path. Use water or air pressure to clear any obstructions that are found and put everything back as you found it. If neither water or air are available, then just use your hand, a small stick, or other tool to carefully remove the debris. Be very careful not to damage the radiator or condenser, which are generally made from aluminum. 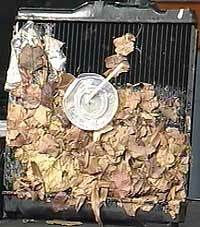 If no restrictive debris is found between the radiator and the condenser, then check the cooling fins of the radiator and the bottom of the fan shroud for restriction. 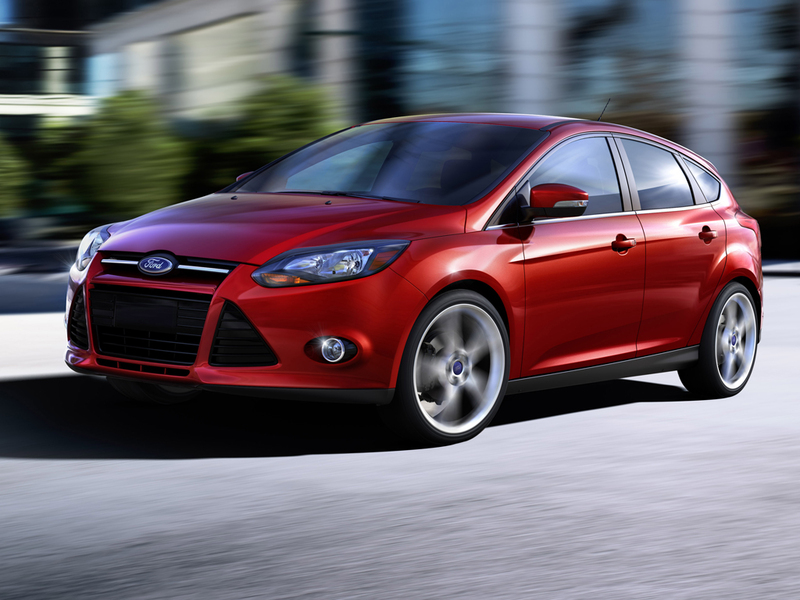 Look at all of the air dams in the front of the car and make sure they are properly installed. On another note: If you’re a/c has been less efficient than normal, especially at idle, it could also be caused by a restriction in the condenser/radiator area. Belt driven fans come in two variations. The first is a straight drive unit that has no clutch built-in and it will chop-off appendages is allowed. The second variety is controlled using a thermostatic clutch that allows increased draw as the engine temperature increases. Either type should be checked with the engine off, initially. You are looking for movement or appearance. The fan and/or shaft should not wobble or move excessively. 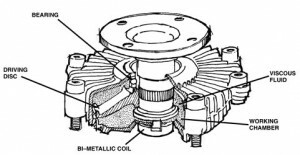 The fan clutch is manufactured using ball bearings between the clutch assembly and the shaft. These bearings are prone to wear out and then fall out. Now is a good time to inspect the fan drive belts for proper tension and condition, as well. To properly test the fan clutch: Allow the engine to reach normal operating temperature and attempt to impede the fan with some type of tool or device (I have found that a thick pry bar works well). Any attempt to stop the fan should be met with a great degree of resistance after the engine reaches normal operating temperature. 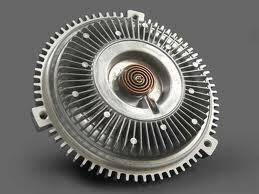 You may also inspect the face of the fan clutch to ensure that the spring and capillary remain intact. If the fan is very easy to interrupt when the engine is hot, or if the spring and capillary are removed, the fan clutch must be replaced. Paper or Digital? How Do You Want Your Owner's Manual? Like winter, summer also can also put a lot of wear and tear on vehicle. How greatly you have explained all the maintenance tips. I liked all the tips and found them helpful for me. Thank you so much for sharing your wonderful suggestions.